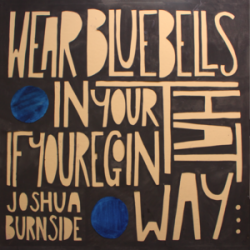 Billed as a “deluxe EP,” Northern Ireland folkie Joshua Burnside’s ‘Wear Bluebells In Your Hat If You’re Goin’ That Way’ pairs his 2013 EP ‘If You’re Goin’ That Way’ with four new tracks and an acoustic version of one of the original EP’s tracks, totalling an even ten songs. The sequence of the original EP has been shuffled slightly for this release. Where ‘Desert Wine’ launched the 2013 EP, this deluxe version kicks off with ‘Little Blind’ and is all the better for it. ‘Little Blind’ begins almost as if you’re walking into a conversation already started. The track builds quickly from acoustic guitar, layered harmony vocals, to drums and banjo, to a parlor-like piano melody, into a glorious wash of electric guitar and distorted vocals – bringing a King Crimson prog-like coda to its folksy underpinning. Among the new songs, ‘Drive in Another Time’ and ‘Mean Man’ bring the most obvious and inevitable Dylan comparisons (circa ‘Freewheelin’’), while the acoustic version of ‘Desert Wine’ completely transforms the song into beautifully longing folk that digs deep into his Irish roots. It’s a definite highlight. Clocking in a little over half an hour, ‘Wear Bluebells In Your Hat If You’re Goin’ That Way’ doesn’t overstay its welcome, and you’ll find yourself humming most of its contents long after it’s done. Experimental folk artist merges sublime new songs with 2013 EP.